Raining Stars, original photography by Joe Ercoli. Walking along a desolate road closed to night traffic at almost 2AM I decided to see what I could do in bulb mode with exposures longer than 30 seconds in almost complete darkness. I would be brave enough to say that the only light here was from the street lights on the Golden Gate Bridge and the full moon rising to the east. I’ve had good luck before with 30 second exposures when there was just a little bit of light, but I had yet to try bulb mode and go for a longer exposure. 30 seconds is the most that my camera will do when setting the exposure length and it took a bit of experimentation to get the exposure right in this new territory. This shot was the best looking one after four earlier attempts that were too dark. I finally turned the ISO down to 200 to keep the noise low, did a little camera math in my head to correct for the change, added a bit of time for a brighter exposure and went for it. With my center column horizontal and the tripod as low as it would go, I was laying on the ground behind my camera holding the remote release like a sniper behind his rifle as I waited for the end of the 300 second exposure (that’s 5 minutes for those of you trying to use “new math” to figure that one out). Unlike my last post, this image has very little Photoshop manipulation. It is almost straight out of the camera and only has a slight color correction. More long exposures to come… Enjoy! 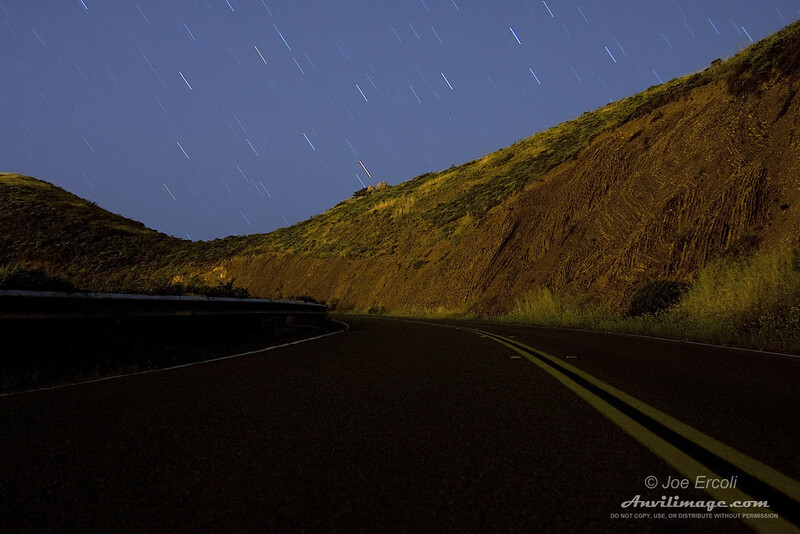 This entry was posted on Thursday, July 30th, 2009 at 2:34 pm	and is filed under Blog, Photos and tagged with asphalt, double yellow, hawk hill, long exposure, Marin Headlands, night photography, road, San Francisco, star trails. You can follow any responses to this entry through the RSS 2.0 feed.